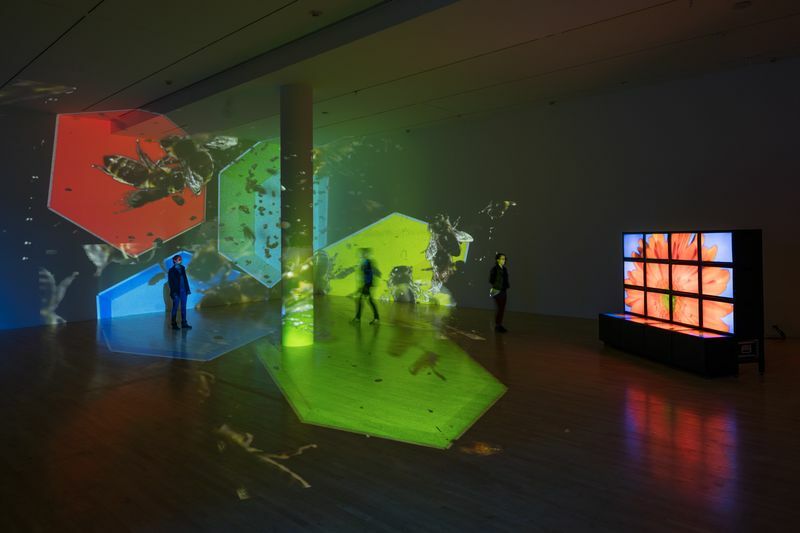 Diana Thater’s mid-career retrospective comprising videos and projection installations spanning nearly twenty-five years – is tightly woven and allows the vibrant colors and intense movements characteristic of the artist’s always-silent works to bleed into each other, generating a distinct overarching mise-en-scène. Situated between the histories of art and avant-garde cinema, her investigation of the shifting materiality of video over a period of dizzying change critiques our participation in mediated environments, in a tone charged by the possibility and momentum of a contemporary technological Wild West. The legacy of structuralist film is pivotal to Thater’s formal syntax, and key works such as ‘Abyss of Light,’ 1993; ‘China,’ 1995; and ‘knots + surfaces,’ 2001, demonstrate the development of her signature moves. 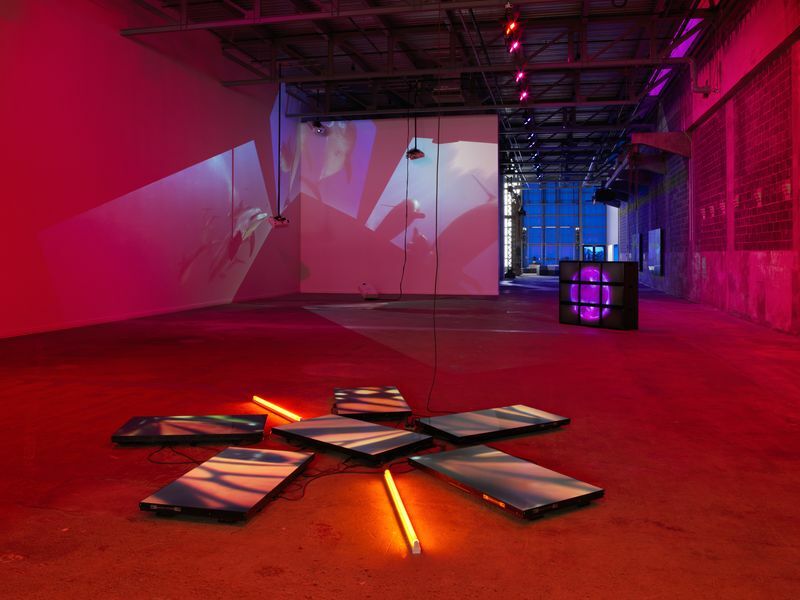 Splitting a video image into its constitutive colors and exposing the underpinning technological apparatus, she embraces spatial interruptions that puncture a received understanding of the screen as an arena for fantasy. In the place opened up by this rupture of narrative-cinema conventions, Thater builds quasi-abstract, psychologically enveloping spaces. Moving images of the natural world – of flowers, honeybees, dolphins, monkeys, landscapes – are beamed across the walls, ceilings, and floors of rooms tinted with theatrical lighting. These painterly video environments are self-sufficient aesthetic worlds configured to trigger an encounter with nature’s otherness. The mood shifts in the recent installations ‘Chernobyl,’ 2011, and ‘Life is a Time-Based Medium,’ 2015, whose somber lyricism and palimpsestic imagery speak to the ecological reality of an Anthropocene era. Yet this exhibition, titled ‘The Sympathetic Imagination,’ consistently maps out how we might imagine the right of the natural other to remain unassimilated by the all-too-utilitarian structures of human representation and interpretation.